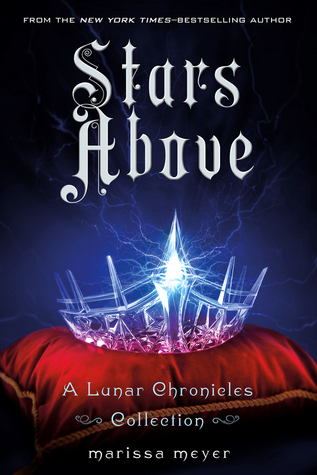 Stars Above is a collection of nine short stories related to Marissa Meyer’s Lunar Chronicles. The stories are in roughly chronological order, starting with some prequels and ending with (essentially) epilogues to the series. Each is from a different point of view, giving depth and backstory to many of the characters. Honestly, I’m always a bit leery about collections like these. They’re usually either really good, or really not good. Happily, Stars Above is on the fantastic side! I loved every single story, even those few that have been digitally released over the last couple years and were rereads for me. I feel like a broken record saying it, but reading this makes me want to go back and relive the entire Lunar Chronicles. Funny story: When I got this book from the library, my oldest son (15 years old) made a snarky comment about milking a series for all the money it can make. I can see his point, sure, and yeah, if a book like this can sell, that’s more money for everyone involved. However, I don’t see this book – or many others like it – in a snarky way. I see this as a way for fans of beloved characters to spend more time with those characters, to learn more about them and see more of their world. I see this as a way for an author to reveal all the careful backstory and planning that they put into these people and this world before being forced, by story-necessity, to cut those story from the plot. As a writer myself, I know how many stories go into planning that don’t make it into the final book. You simply can’t tell everything! And if a collection like this can both help the writer tell those stories she was unable to tell before, and it helps the readers to enjoy more time with the characters they love, I’m all for it!!! So yes. This is a great read for fans of the Lunar Chronicles. Definitely worth picking up. Plus, there’s a bonus: The beginning of Meyer’s next book, Heartless, is included after the nine stories! This entry was posted in 2016, Prose, Young Adult and tagged collection, POC, speculative. Bookmark the permalink. You make great points about collections like these allowing authors to expand on the world that they had to trim down for their final manuscripts. I’ve never been excited for the HP companion books myself, but this helped me to see them in a new light. It’s really a great series! I was unsure about the ending of the first one, wishing it had been standalone, but once I read on, I gained perspective on the first, and found that it was exactly what I’d needed. I want to reread the series in a year or two, all back to back instead of spaced out a year between each read!